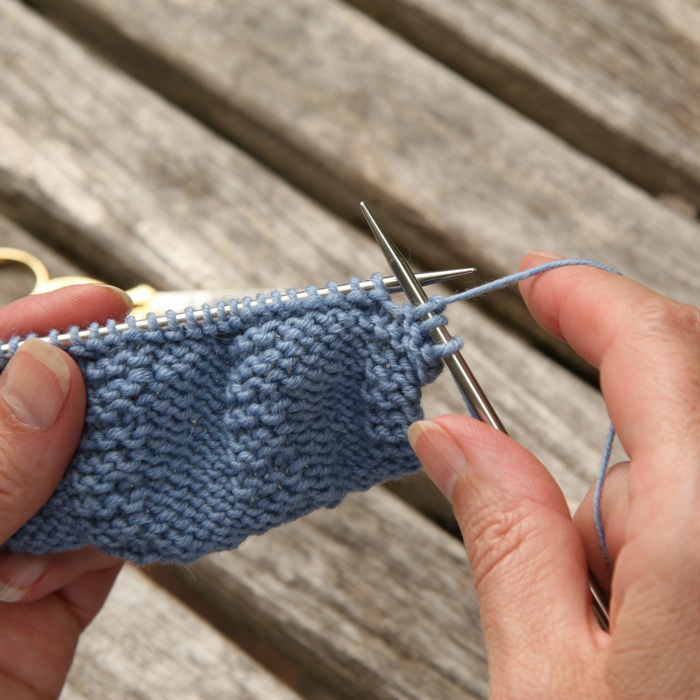 When I taught myself to knit in the early 1980’s life was simple when a pattern said cast on you did just that, a simple cable cast on and off you went. There was only one way to cast on, wasn’t there? It appears there are nearly as many ways to cast on as there are knitters to knit them. I’ve just knitted a scarf for a sample for our yarn at the shows we’re attending this year and stretching my imagination to its limits I came up with the name Sampler. Not being the world’s most creative knitter I thought of blocks of textured stitches divided by squishy garter stitch and eyelet bands and tapered so that there wasn’t too much bulk around the neck, and symmetrical, it had to be symmetrical so it had to have a provisional cast on. The one I chose was a crochet cast on, nice and easy but still too complicated for me to describe in a pattern so I searched out a hand model (Nicola) and made her knit. You will need a crochet hook and waste yarn, try to find a smooth yarn in a contrasting colour to your main yarn and about the same weight. 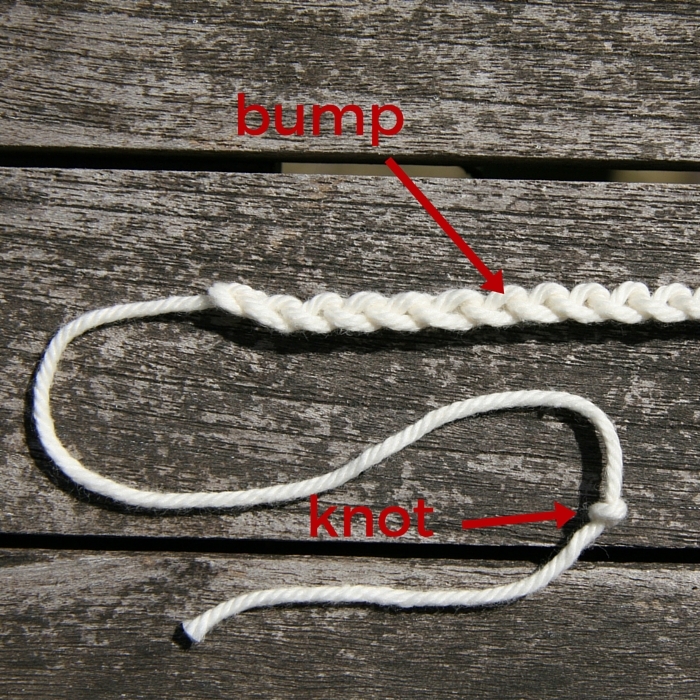 Using your waste yarn crochet a chain that is longer than the number of stitches you need to cast on. So if you need to cast on 90 stitches make a chain of 100. Fasten off the chain and tie a knot in the fastened off end so that later you’ll know which end to unravel from. 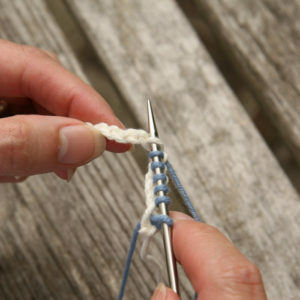 Using your main yarn and starting from the end with the knot insert the tip of your knitting needle into one of the bumps that run along the back of the crochet chain. 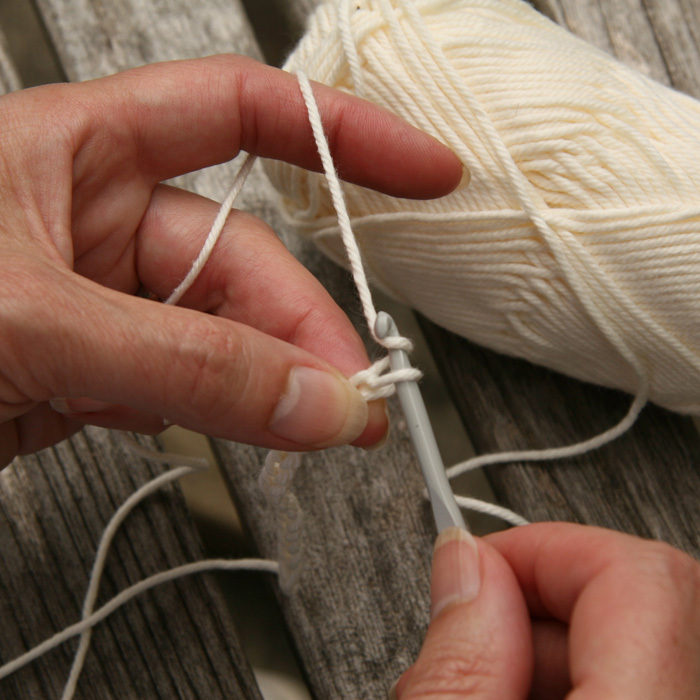 Wrap your yarn around and pull through. 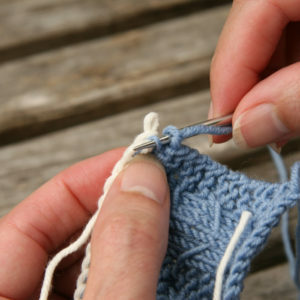 Repeat into every bump along the chain until you have the correct number of stitches for your pattern. 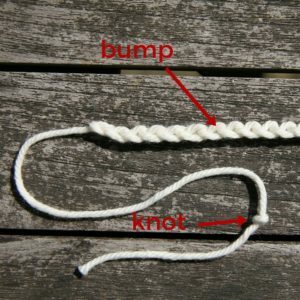 When you need to pick up the stitches start from the end of the waste yarn with the knot in it and unpick the crochet chain. As the chain unravels live stitches can be picked up by inserting your needle into the stitch as if to purl. Don’t be tempted to give the waste yarn a good pull, believe me that way madness lies. The first and last stitches will be a half stitch. If you find you have one too many stitches the last stitch can be dropped without it unravelling. 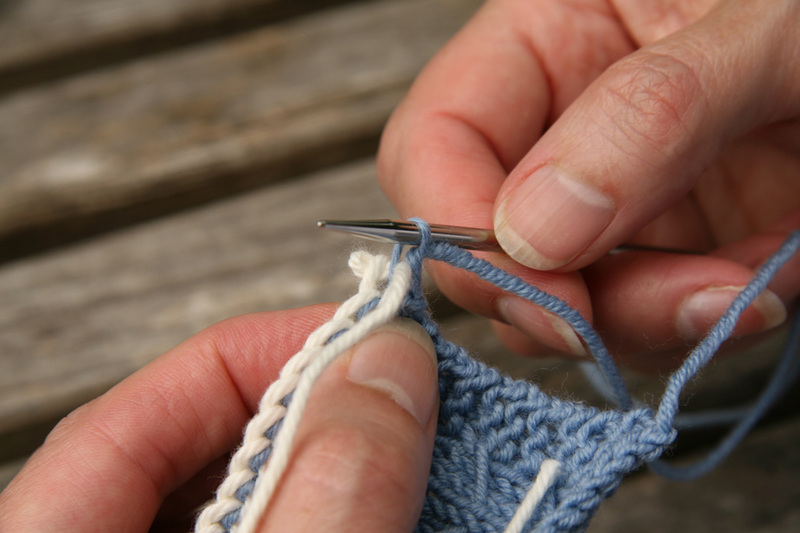 Count your stitches and then continue with your pattern.